In this DIY project we make a 3-Channel Arduino Relay Shield Circuit for relay based applications. We designed an isolated PCB for 3 relays. By using this Arduino Relay Shield, we can operate 3 AC appliances at a time. We have put a two pin screw terminal blocks (Neutral, NO) for connecting appliances. 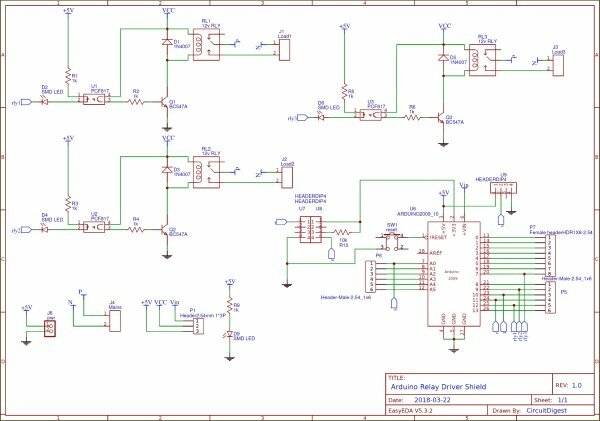 Here we have provided PCB layout, circuit diagram, and Gerber files so that you can build or directly order this Relay Driver Module. Previously we have built 4-channel Relay Driver Module, but this time we are building this relay module as Arduino Shield, so that you just have to fix it over Arduino and it will be ready to use. 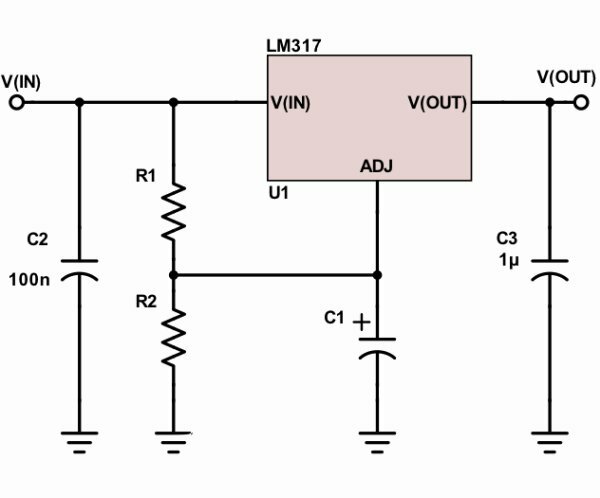 Relays are useful for triggering home AC appliances with low signal and they are used in Home Automation Systems. In this 3-Channel Relay Driver Circuit, we have used an optocoupler to trigger the NPN transistor which further drives the relay. And optocoupler will be triggered by the active LOW signal. Here we have used a 12v 10Amp relay in this PCB board, you can also use 5v relays. For demonstrating this Arduino Relay Driver Shield, we have used an Arduino Uno board for controlling relays. We have connected all 3 relays with Arduino at 7, 9, and 12 pins (RLY1, RLY2, and RLY3). We have used a 12v adapter for powering the circuit. Then we have connected 220VAC bulbs at the terminal block of the PCB board and AC supply is also applied to the board. Check the Demonstration Video at the end of this project. 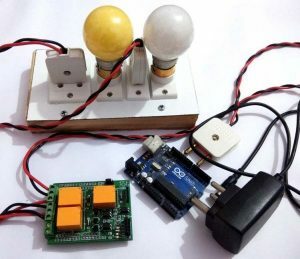 Complete Arduino code is given at the end of this project, code is simple and easily understandable. If you want to learn more about Relay and its interfacing with Arduino then follow this link. You just have to fix the Arduino shield over Arduino and control 3 Appliances using this shield. You can use the given code (in the end) or use your own code for controlling the AC appliaces. 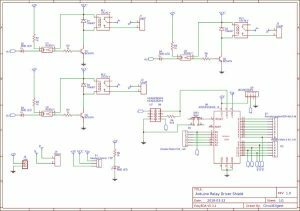 To design this Arduino Relay Shield, we have chosen the online EDA tool called EasyEDA. I have previously used EasyEDA many times and found it very convenient to use since it has a good collection of footprints and it is open-source. After designing the PCB, we can order the PCB samples by their low cost PCB fabrication services. They also offer component sourcing service where they have a large stock of electronic components and users can order their required components along with the PCB order.